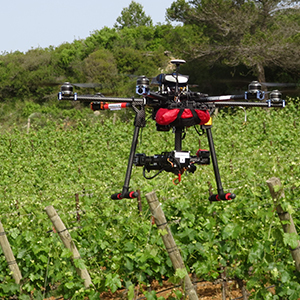 The EO Team recently obtained financing from the Canadian Space Agency to combine the use of drones with artificial intelligence algorithms in order to scout for grapevine diseases. Using a risk map produced from soil moisture levels derived from SAR data and a bioclimatic model, drones can be used to screen for the presence of pests. This solution will contribute to the rational use of agricultural inputs. During discussions with different players from the “agricultural world” (producers, consultants, researchers), the need for reliable automated scouting tools to facilitate the rational use of agricultural inputs has proved to be of the utmost importance given the impending regulations on using inputs. Applying agricultural inputs in a reasoned manner (right product, right dose, right place, right time) will reduce waste and increase net profits for agricultural producers. Automatic scouting by drone, whose price (a few thousand dollars) represents a fraction of the cost of specialized labour (being in very short supply), allows to reduce the cost and effort involved in this operation. The deepSAT project (deep learning for better use of unmanned aerial systems in agriculture) will help convert data acquired via drone into useful information for the farmer by taking full advantage of all the benefits that capture, storage, transfer (the Internet of things) and processing (artificial intelligence) technologies can provide.